I defy anyone from my era to take the Yellowhead Highway west from Edmonton to Saskatoon without the voice of Burton Cummings, mile after straight-and-flat-mile, reverberating through their head off the great prairie, like a bad acid flashback, singing the iconic Guess Who song. Until now you’ve read about the Meandering Maloneys great adventure from the Dame’s point of view– convivial, upbeat– but lacking the grounding of a male perspective. The Dude,who most of you know is a glass-half-empty-guy, notes that the wild rose is off the bloom in Alberta’s oil city. Old time Edmontonians are laughing off the declining price of oil with been-there-done-that-shrugs while the newbies giggle nervously at any suggestion the boom is over. The boom is still on at the Yellowhead Casino poker room. The 2-5 no limit Hold ’em game starts in the afternoon and goes all night. The Dame, who is not a fan of all-night poker games, tapped the Dude on the shoulder at about nine-o’clock indicating it was time to head home to the Grey Ghost. 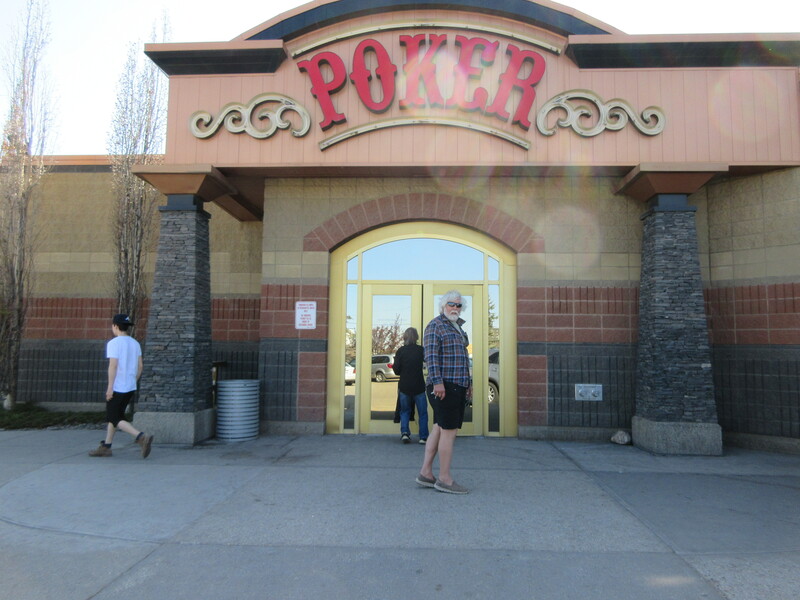 The Dude coolly negotiated three more hands to play his button and promptly hit the ignorant end of the Bad Beat, which unfortunately is capped in Alberta. Still, a nice to start the trip with some Alberta money in the jeans. Highway 16 East cuts through the prairie like an asphalt anaconda, its head always out of sight over the distant horizon. Weird whistling aside,,the Mean Towing Machine has performed admirably, pulling the Grey Ghost with a belligerent diesel snarl. Riding the snake. Running smooth all the way to Saskatoon.